Keras is a Python library that provides a clean and convenient way to create a range of deep learning models on top of powerful libraries such as TensorFlow, Theano or CNTK. Keras was developed and maintained by François Chollet, a Google engineer and it is released under the permissive MIT license. Below are the tasks of this lab session. If you don’t finish all of them during this session lab, please, read last Task before leaving classroom. First of all, using your browser with jupyter, open the Keras examples folder and locate the mnist-keras-book file. Try to run all the blocks t in order to check your Keras installation. Identify how Keras reads the data. Identify where the neural net definition is. Which are the layers used on this net? Which are the activation functions used on this net? Identify the loss and optimizer functions. TensorBoard is a visualization tool included with TensorFlow. 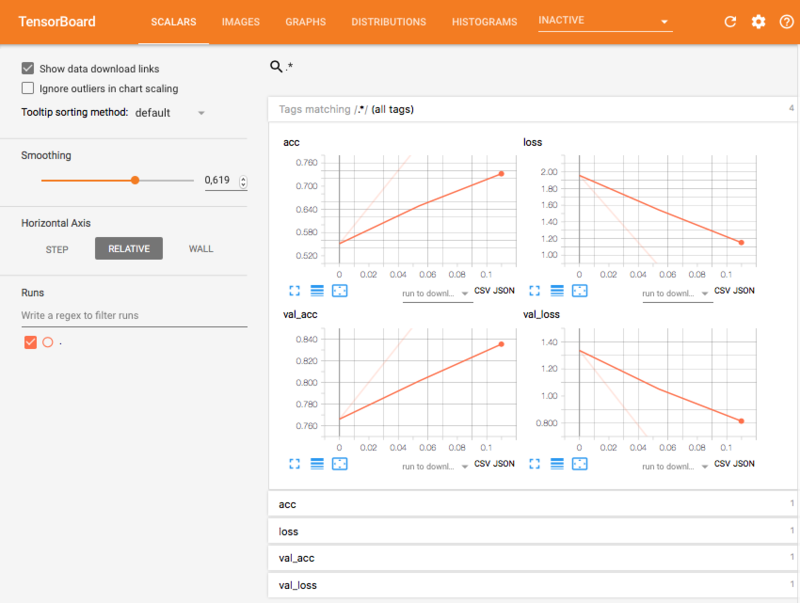 You can use TensorBoard to visualize your TensorFlow graph, plot quantitative metrics about the execution of your graph, and show additional data like images that pass through it. In this lab we will use it to visualise information about our Keras network. The code contains the variables tensorboard_dir and tensorboard_active that allow the TensorBoard execution using the Keras callbacks. If you put tensorboard_active to True, Keras will start to save TensorBoard data to tensorboard_dir every epoch. Modify the tensorboard_dir value to a folder for saving the TensorBoard data. Change the tensorboard_active value to True. Before running the script, clear the jupyter kernel (Kernel -> Restart and clear output). You can run TensorBoard and Keras at same time, Tensor-Board will update the data every epoch. TensorBoard: Visualizing Learning, which gets you started. TensorBoard: Graph Visualization, which explains how to visualize the computational graph. Graph visualization is typically more useful for programmers using the low-level API. Going through the jupyter notebook, modify some hyperparameters (batch size, number of epochs, learning rate), optimizer, loss functions or the layers of the model. Use TensorBoard and the logs to observe the new accuracy. Before running the script, clear the jupyter kernel (Kernel -> Restart and clear output) and modify the Tensorboard folder. Take a look to the TensorBoard docs for seeing how to merge different runs in one chart.